The go-kart track may or may not be the ideal metaphor for the competitive environment that MBA students exist in – but at the very least it is a terrific venue for removing oneself from the academic grind, if only briefly. Recently, Corporate Champions Vancouver organized a major-league go-karting event with 600 participants and over 30 organizations – including SFU’s Segal Graduate School of Business. In the heavily-contested Heat 2, three SFU MBA teams went head to head with each other and 9 other corporate teams in a race of endurance – how many laps can a team do in an hour. The SFU MBA teams had some tough (and high-profile) competition, with rival teams from Electronic Arts Canada, Rogers Communications, PLC Construction, and PriceWater House Coopers. 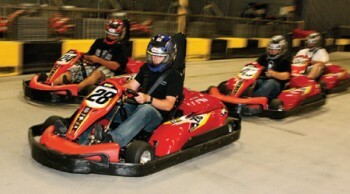 It was an exciting race – flying visors, crashed go-karts, and speedy pit stops! It was a great experience for these eager MBA students to bond and show Vancouver’s corporate world their competitive spirit! It was a tight race between SFU Team 1 and SFU Team 2, but in the end, SFU Team 1, consisting of Clement Lim, Pamela De La Flor, Jeff Norman, Lee O’Donnell and Alessandro Stocca placed second overall. SFU Team 2, consisting of Michelle Au, Colin Lam, Neenu Dhanoa, Angela Daminato and Jocelyn Wong placed third overall. Bringing up the rear with another great effort was SFU Team 3; members included Ken Lee, Christy Ren, Helen Lau, Naji Shahla and Georgios Chatzivasileiou. A great study break for these students and some well-deserved fun – so way to go team SFU! Next on our list of competitive events… the MBA GAMES in January 2011! Stay tuned…. Next story Need a pep talk? Find a friend!